I googled the distance to the canyon from where I was in central Colorado a week ago, saw it was surprisingly close, a mere 10 hours which I judged as less than a day rather than in absolute, holy crap that’s a decently long drive, terms. I hit the road, driving only during the day to not miss the sights along the way and enjoyed driving out of the deep snow and into the mesa filled desert of southwest Colorado, New Mexico, and then into Arizona. It was overwhelming seeing the 14k foot peaks disappear behind me; it really put into perspective what I had been doing the past few weeks. It was hard to comprehend exactly how big those mountains are until I saw their peaks towering behind me in the distance. I drove into the national park just before sunset, caught my first glimpse of the deep gorge since that hike a couple years ago, and it was absolutely just as overwhelming as the first time. But from the rim it’s photogenic, but can’t quite instill the same kind of awe as the canyon imposes from down at the Colorado River at the base. I wanted to descend; I needed to descend. At the ranger station I asked for some beta on the trail conditions and got skeptical glares and frank disapproval. 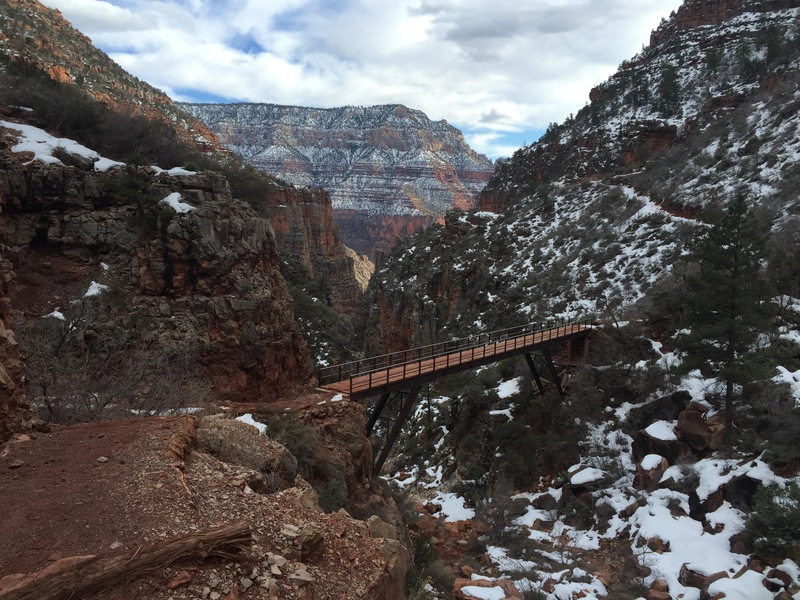 The north rim is closed in the winter, so when you start asking about conditions twenty miles away, the rangers treat you a little differently than if you go in asking about the paved trail that loops around the village. I’ve dealt with their bitterness before and totally understand it. They get 25 year old jocks who think they can come in and descend to the river and back in one morning who end up needing a rescue just a few miles into their hike. The canyon is dangerous and the emergency phones linked up throughout the hike is evidence of that. By default the rangers have to be distrustful and discourage any crazy feats of human endurance in what they see as no place for silly endeavors. 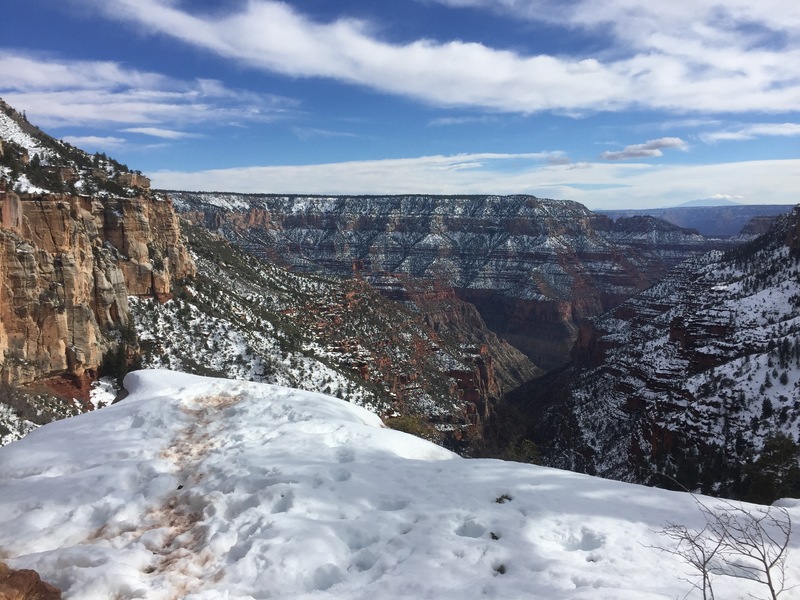 After pressing a bit and encouraging confidence, I learned that it had dumped over thirty inches of snow on the North Rim just days earlier, compared to the meager 10 inches that I saw coating this side of the canyon. I couldn’t carry snowshoes all the way across the desert abyss so I was going to count on people breaking trail before me or the warm 50+ degree temperatures having melted it a bit. And I thought, naively so, that the north side would have the southern exposure which would aid in melting some of that deep snow. The next day I woke up just before sunrise and was not feeling it. To be honest, I was dreading it. I felt crummy and exhausted and any idea of movement seemed entirely unappealing. I turned my alarm off and went back to sleep. Eight hours later I woke up again, happy to have gotten some seemingly much needed rest, but also nervous of what might have necessitated it after my simple couple days of easy driving. 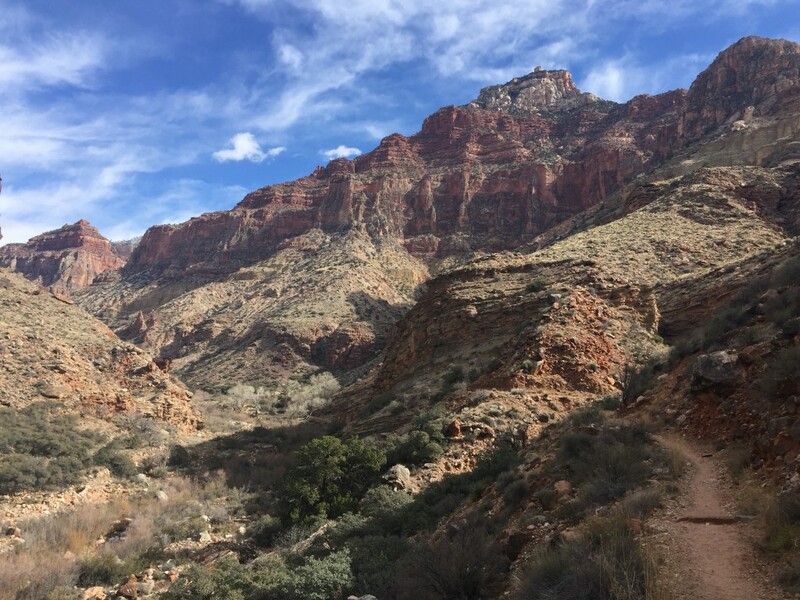 I didn’t look much into it though, went on a quick run to scout out the South Kaibab trail, pronounced KybAb (I moronically pronounced it like the meat on the skewer), which I would descend the next day. Then I drove to the village deli, got some grub and used their wifi to write-up some reports from a few 14ers I had climbed in the preceding couple weeks. I got an early night sleep despite my 16 hours of rest and comfortably slept with the warmer temperatures than I had been dealing with in Colorado. I woke up at 6:45, and moved sluggishly getting ready. My pack was already good to go, but I intended to hydrate and fuel up before the plunge into the canyon. Setting out from my car at 7:30, I still had a mile hike to the trailhead and then needed to drop off some weight in the privy before my long day ahead. I dropped from the rim a little after 7:40 and soon saw a couple other hikers working their way down. The sunrise illuminated the opposing side with orange light that was an incredible start to the day. But the low clouds soon obscured it and I was left in cool shade for the rest of the trip down. 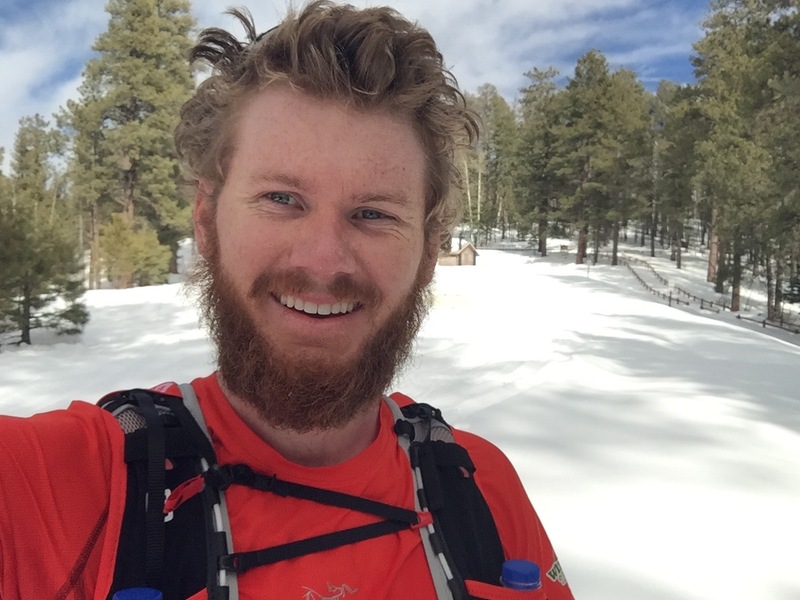 I wanted to start out conservatively, having not hiked more than 15 miles in a day since I dropped off the Appalachian Trail in early July, and not knowing how my body would handle it. On easier stretches I did some jogging, but for the most part settled for quick hiking on the gnarly trail. 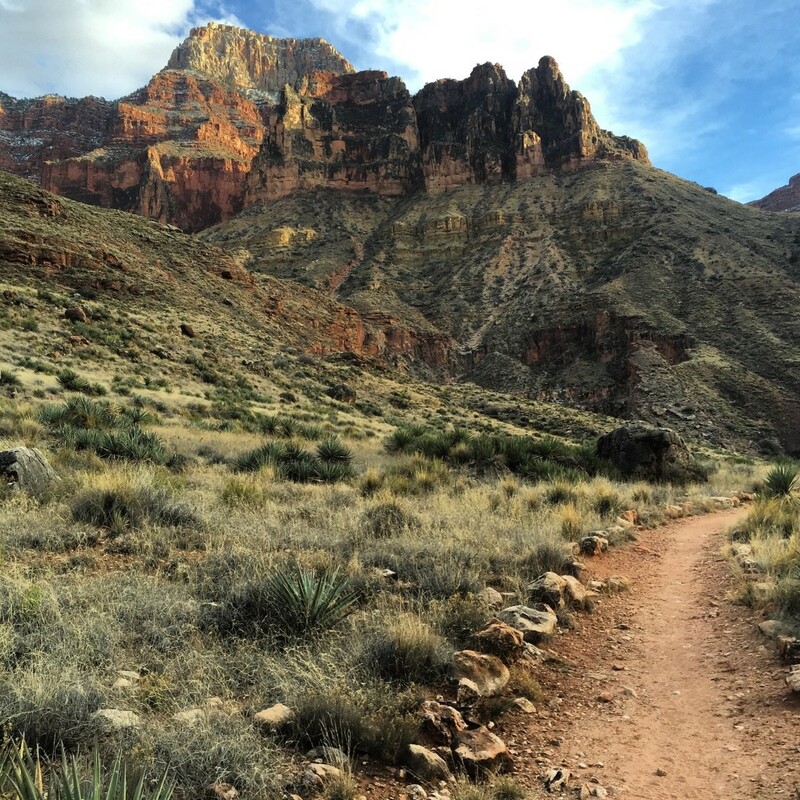 Being the main passage for mules down the canyon, the South Kaibab trail is rutted and grooved with a thin layer of mule crap covering a sheet of ice on the upper mile. Below that the red sandstone dirt is laced and turned a vomit-inducing green from the decades of mule dung piled up. At reinforcing boards along the trail to prevent erosion, meltwater from the snow above has run down and puddled with root-beer colored pools of crap that sting my nostrils and threaten to coat my trail running shoes with the filth. But the further I descend the better and clearer the trail gets. I figure the harder climbs toward the top are as much of a laxative for the pack animals as it is for me. Other hikers were working their way up toward the South Rim with some packs as small as mine and I figure they most have been visitors at the pseudo-resort down at the base called Phantom Ranch. Their tight Under Armour get-ups, backwards baseball caps, clean shaven faces, styled haircuts, and total disinterest at anyone else on the trail were sure signs of glamping, and their lightweight packs gave it away. I had taken off my jacket and pants just a mile in, with the temperatures warming drastically with the faint sunlight beaming through and the dropping elevation. But my first time in shorts in nearly two months led to a brutal surprise. Within the first three miles, an excruciating rash was forming on my inner thighs. It stung with the most I’ve sweated this winter and I knew I couldn’t take another 40 miles of it. I dropped my pack and reached in for a roll of athletic tape that I had brought along in case of blisters and set to taping up the entire surface of my inner thighs. It worked wonderfully, despite the tension on the remnants of hair, but worked its way loose by the time I reached the river. I stopped, dropped my shorts, and slid on my running pants, uncomfortable with the idea of covering my skin in the heat, but more fearful of the bloody rash forming. They worked wonderfully. 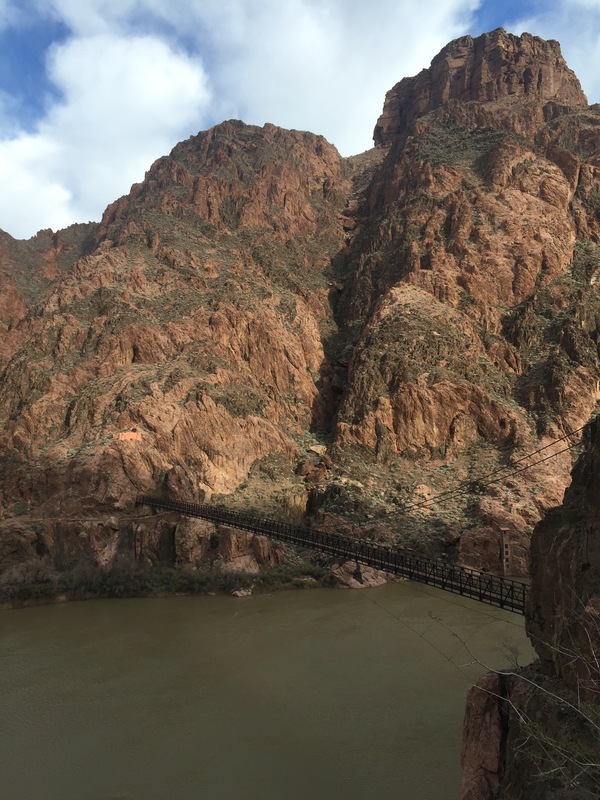 I made my way across the suspension bridge that crosses the raging Colorado River a little after 9:30, less than two hours from the Rim 7.5 miles behind me. I set my goal pace at a conservative but realistic 3mph, and hoped to reach the North Rim by 2:30. 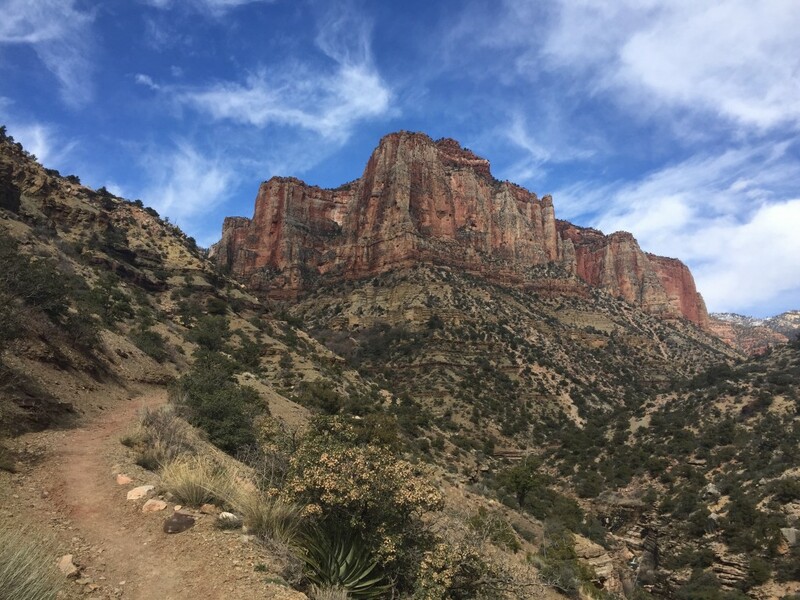 The trail flattens out on the North Kaibab trail and passes by the Bright Angel Campground where backpackers were cooking breakfast and packing up, getting ready for their ascent back up the canyon. 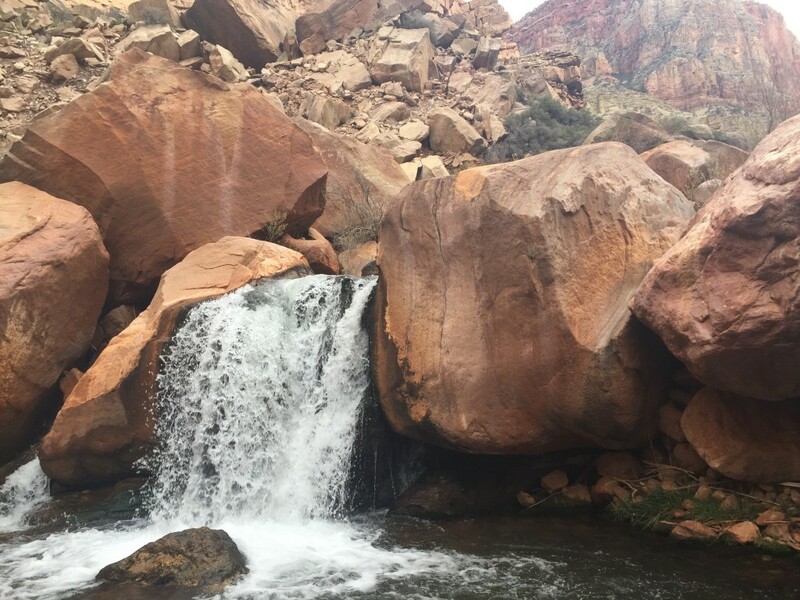 Tracing the Bright Angel Creek, the trail then comes to Phantom Ranch, with electricity and running water and I smelled the faint scent of exhaust from a running dryer. I couldn’t believe that this deep in the canyon that the staff was doing their own laundry but I was amazed. 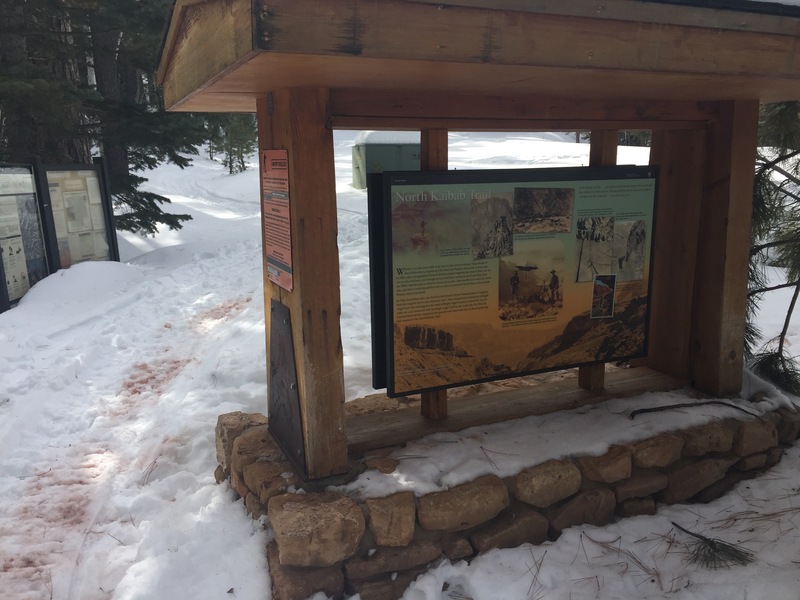 Some hikers would be critical of the tainting of the backcountry. But I loved it and would be hiding the truth if I didn’t express interest in coming back here someday and staying at the Ranch when I have a bit more cash and maybe a family. Maybe when I’ve settled down a bit. The trail winds through a deep gorge with steep walls along a well-worn and beautiful maintained trail and crosses steel bridges across the creek for more favorable terrain. A few other hikers were working their way up this slot canyon, undoubtedly to return to their bunks at Phantom Ranch well before dusk. 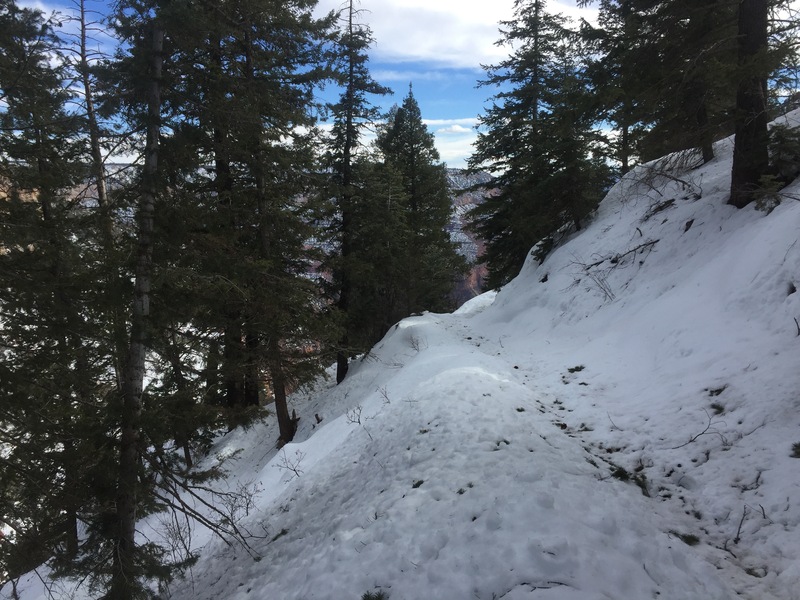 When the trail left the steep walls for a more open and farther spaced canyon, the trail picks up slightly heading toward Cottonwood campground. I was sure I had seen the last of humanity but a mile before I hit the campground a blue-backpacked ranger was working his way up the trail. As I passed him, he pulled in behind me and I slowed my pace for a second to exchange greetings. “Where did you start today?” he asked. “South rim,” I responded, expecting an interrogation and lecture on the idiocy of my endeavor. “Yeah man,” I responded bluntly, hoping to work my way off before the obligatory ranger monologue began. “Holy hell! Alright man, well good luck!” he responded with an unfamiliar enthusiasm. “Thanks man! I’m excited!” I said in surprise at his excitement and then kept plugging along. It was awesome and refreshing to have some support for my goal after encountering the bitterness up at the ranger station a couple days earlier. It gets really hard being out there alone, feeling the hint of soreness creep into my legs a mere 15 miles into the day. Left alone, my frustration may top out on its own at something resembling mild, humorous self-deprecation. But with discouragement and skepticism from a stranger, the minor self-pity can morph into full-fledged convinced doubt that I can accomplish what I’ve set out to do. At any rate, I’d usually rather be left alone until I’m confident in what I’m doing. But his encouragement instead knocked down any thoughts of the absurdity of what I was attempting and I loved it. And I am so appreciative to him for it. 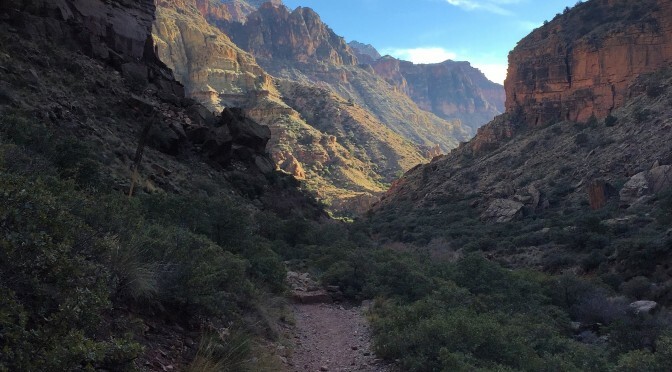 The rim to rim to rim hike of the Grand Canyon isn’t unfathomable to me. I want to clarify that the 42+ mile distance isn’t what makes it so hard. Nor is it the 11k+ feet of elevation gain. What makes this hike unique and so much more daunting than some of my other 40+ mile hiking days is that to bail, to get out, requires an incredibly grueling feat in itself, to climb the canyon walls to the rim. There’s no chance of receiving much help from anyone else. There are no roads. And the worst of the day always lies ahead. Up until the absolute last few steps, the day will only get harder. To be honest, that is what scares me about the hike, and why I can’t encourage anyone who isn’t familiar with logging 40+ mile days regularly to attempt the rim to rim to rim. Up at Cottonwood campground the water had been shut off for winter so I skirted down to the creek to top my bottles off for the first time of the day. I had begun with a liter of Powerade and was just now finishing it so I had some work to do catching up with hydration. Impatient, even with Aqua-mira in my pack, I dipped the bottles in a drank straight from the creek. A couple empty tents sat in the platforms and I suspected I may find their residents on my way back later in the day. Past the campground, with 6 miles left to the North Rim, I was entirely alone. The trail sharply rose with around 4000 feet of vert left to gain before I could stand at the North Kaibab trailhead. But I felt good and cruised on the packed path. 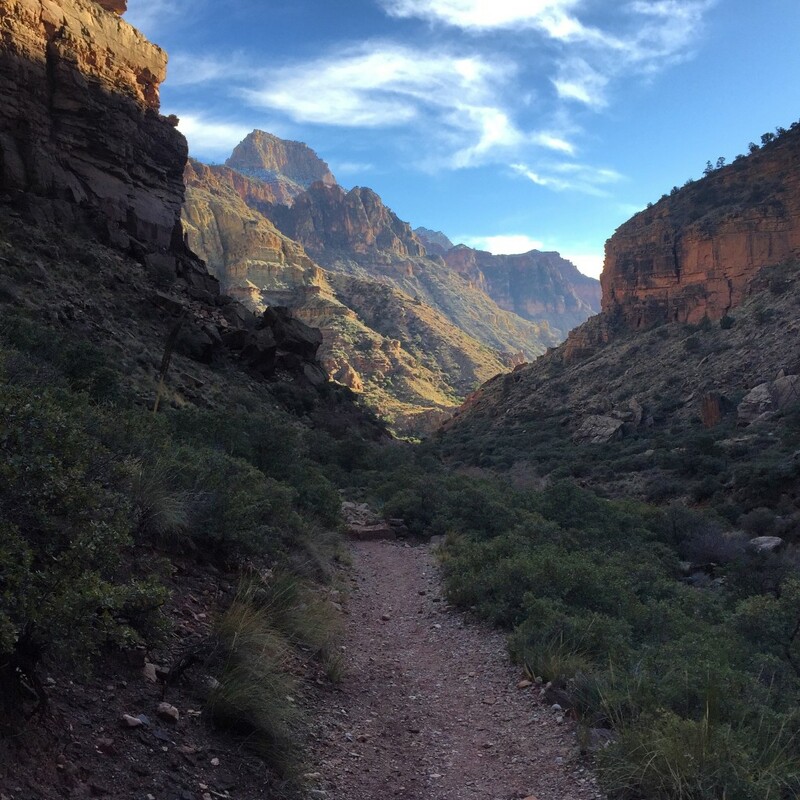 The trail was in great condition compared to the mule worn South Kaibab trail. 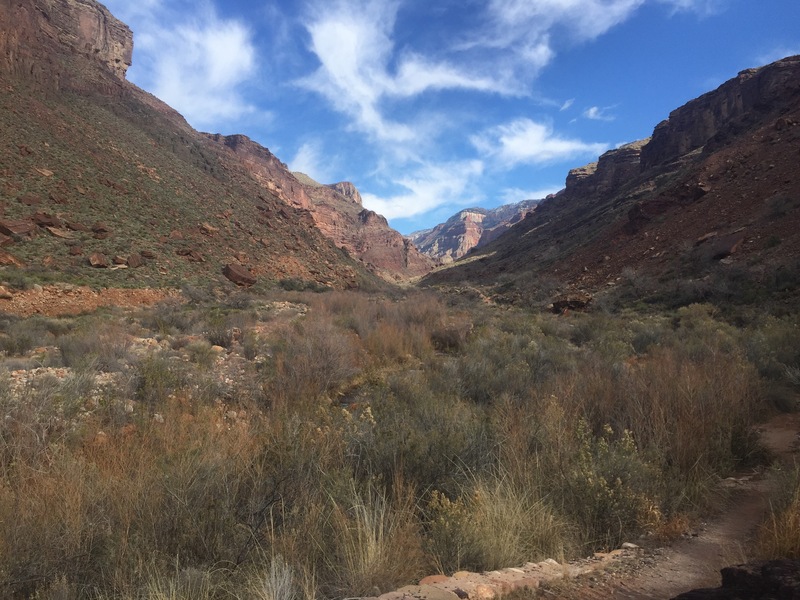 But occasionally I came across large slides strewn across the trail, signs that the Grand Canyon wasn’t a static formation but a growing abyss with decaying walls. As I gained in elevation a thin, dirt-laced layer of ice covered the trail but not enough to necessitate the microspikes which I had carried all this way. Up further the ice turned to snow. 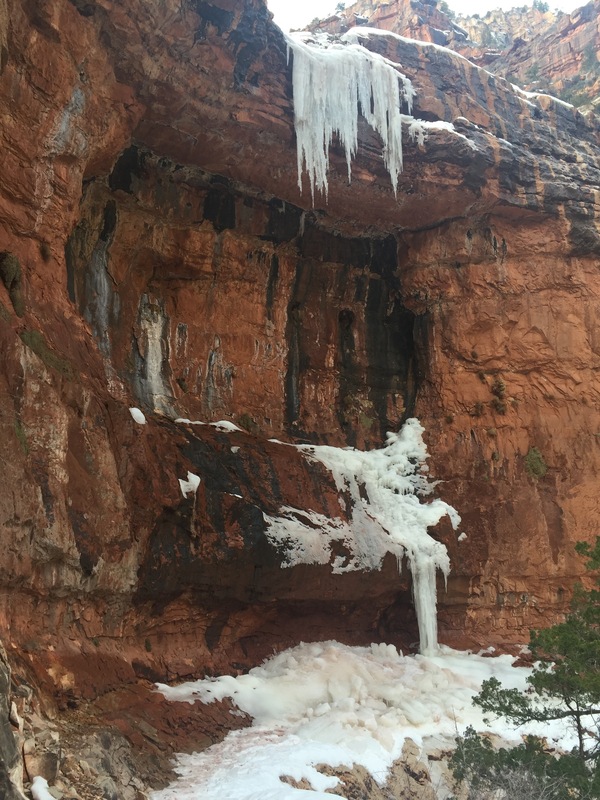 Large icicles dangled from the canyon walls and flooded the trail with torrents of freezing waterfalls from above. They were a welcome break from the 50+ degree temperatures and stale air, which felt like blazing heat to me after my month in the Rocky Mountains. As I neared the North Rim I could see the trees on top grow bigger and I could swear it was just around the next bend. The snow deeped and I was postholing every few steps through the melting ice crust. I was thankful to have my pants on to protect my shins and ankles from the shearing ice but it still cut and scraped and the cold stung my lower legs. The snow deepened to nearly three feet but around some shaded switchbacks I was able to ride on top of the snow. And after two miles and over an hour of postholing, I finally made it to the top. I forced a deceptive sort of joy, knowing that I was going to make it, or at least had to make it, but that I was not done yet. I spent a couple minutes eating an oatmeal creme pie and drinking the last of my liter I had carried up before getting started back down. With the extra force on the descent, nearly every step plunged down into the over two feet of snow. I consider myself a fairly fluid and steady hiker, but I was an absolute mess of flailing limbs on the way down. It was torture and I couldn’t wait to see the red mud further down the slopes. It seemed to go on forever and I was hating every step and blasting myself for my stupid decision to attempt this. I wasn’t having traction issues but I tried my spikes anyway to see if they somehow helped but they were useless without flotation. Eventually I made it down to the squishy mud downhill from the snowmelt and celebrated harder than I had on the North Rim. Despite the nearly twenty miles I had left, I started feeling confident. The mud dried to firm dirt and I picked up the pace. Soon I was running down the trail. Despite a little tendinitis in my left knee, I was feeling great. I came across the three hikers whose tents I had seen at Cottonwood Pass and they asked if I was doing rim to rim to rim. When I confirmed their guess they got excited for me, whipped out their hands for high fives, and wished me well. I passed the ranger I had seen earlier, and with dusk approaching he asked if I had a headlamp, ensuring a safe trip back to the south rim. I plowed through Phantom Ranch, slipping by the visitors bundled up, chatting in the common areas around the cabins before sunset. And down at Bright Angel Campground, I smelled the wonderful scent of backpacker meals being cooked at the picnic tables. I wanted so badly to stop and enjoy the other hikers conversation and laughter, and enjoy a warm meal. Down to the river and across the suspension bridge all I could think about was how amazing a warm meal sounded right then. I had forgotten how much food I typically eat on these big days but fortunately had packed extra for that exact reason. I had destroyed a bag of cookies, a bag of swedish fish, five oatmeal creme pies, and four chewy dips bars (which have become my favorite high energy food after candy). With darkness coming on fast so deep in the canyon, I paused to grab a snack and pull out my headlamp. I sat down on a flat rock on the uphill side of a switchback on the trail and looked down at the river. What I had done already was awesome. It had been a great day and I had seen more of the Grand Canyon in a day than most people can ever hope to in a lifetime. But I still had a grueling climb out and I wasn’t much looking forward to it. As I sat munching on a bag of buttery Town House crackers, a mule deer poked its big eared head up over the edge of the trail and looked at me. Surprised, I sat up quickly and said, “Oh! Hello,” and quickly realized how much of a dumbass I was for chatting with a non-verbal mammal in the middle of the desert by myself. A hundred yards above the river, I noticed I had less than half a liter of water left. I know myself, and I know I always make the wrong decision with regards to hydration. And despite this chronic issue, I once again screwed up and decided to keep going rather than heading back down to snag an extra half-liter. On the steep climb, I started dripping sweat in the 50+ degree temperatures. My back was soaked and my forehead dripping and I felt overheated. I slowed the pace and eventually had to stop to take a break, just a mile above my last stopping point. I was struggling and everything seemed to start working itself out of my control. I didn’t have enough water to take any more than small sips, I was ready for bed, I was hungry but didn’t want to eat much without water, and I was steadily getting overheated. I went through a very slow process of walking a few hundred yards before sitting down on a stone and wallowing in my self-pity. It was too hot, plain and simply. Any other time in my life, 50 degrees would feel cool, but after adapting to temperatures down to -20F in the high Rocky Mountains, I wasn’t doing well with the moderate heat. I tried pushing through it, after all I was only a few miles from the top. But when I tried this I only shut down more quickly. I tried hiking slower, and that seemed to work for a bit. On one of my rests, I looked around at the dark canyon walls. In the daytime they had been colorful paintings, begging me to descend down into the side canyons. But on this moonless, starless night beneath a blanket of clouds with no illuminating city within miles, their deep black became menacing and claustrophobic. They seemed to be towering over top of me just a foot away and crowding in with every second I looked. I decided to not look at their unwelcoming presence and kept the beam of my headlamp on the ground surrounding me. At one point, I shined the beam of my headlamp down into the rocks just off the trail and two beady glows reflected back. I had been able to see the headlamps of a few campers down by the river but they were long since gone this high on the ridge and I couldn’t imagine what I saw. I kept looking and the two green beady eyes glared back. I saw two huge ears sticking up above the eyes and couldn’t for the life of me figure out what I was looking at. I wouldn’t consider myself an expert on the mammals of the Grand Canyon, but I certainly didn’t think I was naive enough to be unfamiliar with a big eared alien looking right at me. I skirted further up the trail, hoping to get a better vantage from the back of the animal and saw its huge tail resting on the rock behind it. Not a cat, not a canine, I was even more confused than I was before. Turns out when I did my research later I was looking at a ringtailed cat, a super cool sighting, one that I am elated to have witnessed but simultaneously bummed that I wasn’t discovering a new Grand Canyon mammal species. I came to the halfway sign, indicating equal distance between the river and the top and felt hope, but still more dread at the tremendous elevation gain ahead of me and what would certainly be nearly two hours of hiking at this pace. But just above the sign, a little higher on the ridge the wind started picking up. High winds, with up to 40mph gusts had been predicted for the day and I rightly figured most of the canyon would be sheltered from the weather. But this high on the wall the wind started blasting me, throwing sand into my eyes and ears and onto my wet face and arms. But most importantly, it started cooling me off. 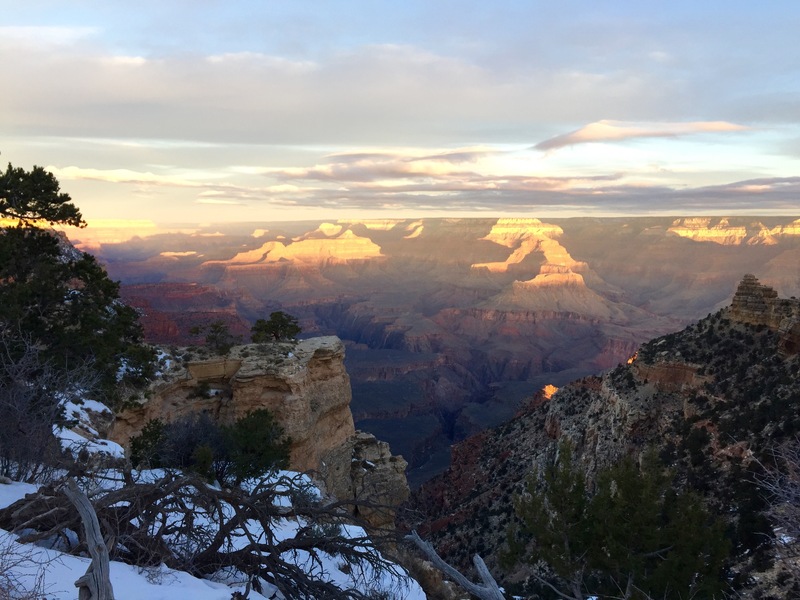 My neanderthal-like short and stout body isn’t made for the heat of the Grand Canyon, but when the wind chill dropped below freezing, I was a happy man, despite being in a t-shirt. When I cooled off I started rocking, knocking out trail beneath me with ease. I took the last sip of my water and was climbing like I had just started. The wind was gusting hard, in what has seemingly become the norm for the past month for me, and threatening to throw me from the narrow trail over the cliffs off to the side. I planted my poles through the worst, tucked my head, and stood still until the wind abated. But the blasting wind sent flying dust grating at my corneas and filled my ears with enough red dust to fill a small sandbox. Closer to the South Rim the walls get steeper and the trail sheltered between ridges and the wind died down. And despite the elevation bringing lower temperatures I once again started dealing with heat exhaustion. I was stopping to sit on a stone at nearly every switchback, trying to pinpoint distance from the top with familiar landmarks but nothing was recognizable in the darkness. I stopped at one point, put my head down on my knee and quickly fell asleep.. I have no idea for how long. But I woke up chilled and dazed. I hiked slow and carefully on the dung-covered ice and just when I was about to sit down for another rest, the deep darkness revealed the sign marking the South Kaibab trailhead. I had done it. I stopped at a spigot to fill my bottle and drank it instantly. And on the flat road walk out I started shivering so violently I had to put on my down jacket. 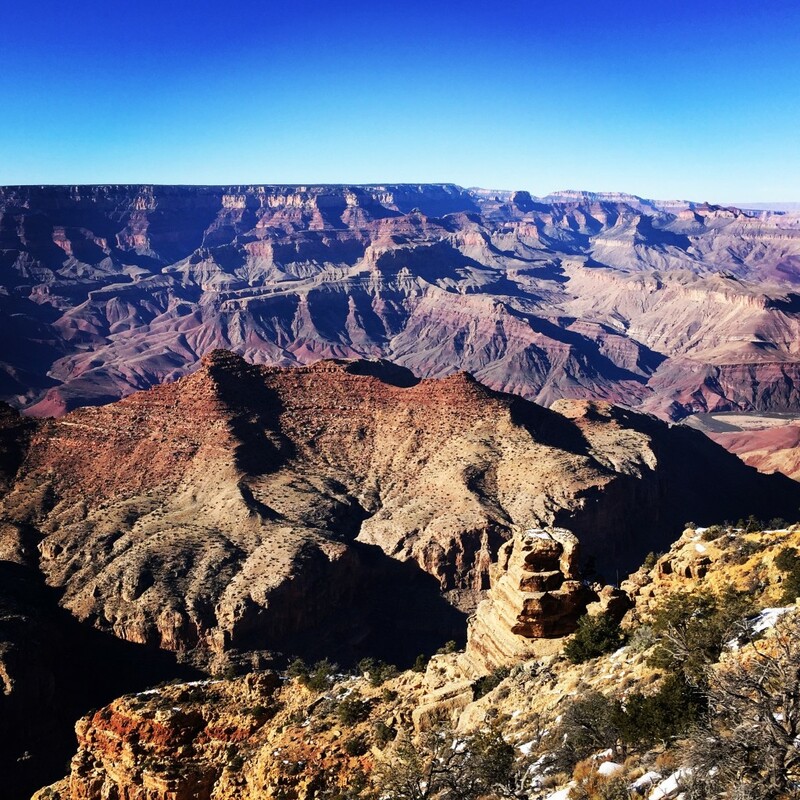 They say that the Grand Canyon is a world of extremes, and having hiking through deep snow, desert, shivered, and struggled with the heat, all in one day, I can definitely attest to that. I made it back to my car after the relatively short road walk, stripped off my mule crap covered pants and shoes and jumped into my drivers seat. I blasted the heat, now freezing from the cold temperatures at over 7000 feet, and downed four bags of chips and a bottle of Powerade before crawling back into my makeshift bed for an extremely fitful night’s sleep with my sore legs. Down in the canyon I had made silly self-assurances that I would never do something this grueling again. I promised myself, confidently swearing off any future misadventures of pain and agony. But even with just a day of rest, the remembrance of the suffering is dissipating and my craving for another trip is building. Besides, you can’t get glorious adventure like that without being prepared for a little hardship.